Kinder surprise egg was definitely my favorite treat when I was growing up, and I sometimes manage to buy them for my kids here in the USA, at my local ethnic food stores! There are other versions too. 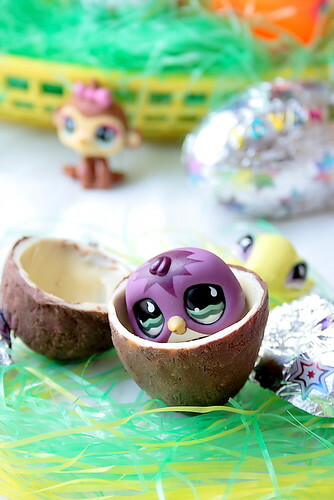 You can read more about it here, and here is the Canadian website for Kinder egg Surprise. It’s a chocolate egg with shell made out of two thin layers of chocolate. One with regular milk chocolate, and another with white chocolate. Inside is a little plastic container, containing a toy. Then I coated the inside (of course) with chocolate. First with regular, the I put it in the freezer for about 20 minutes, then I carefully added a layer of white chocolate over the first layer. Back in the freezer, then simply got it out of the plastic shell, peeled the foil, and voila, I got chocolate egg halves. Sure, it’s not as smooth as store bought, but good enough for me, until I get hold of some molds. Then I just placed the corresponding halves over a heated stove top for few seconds so I can seal the halves into a whole egg. Inside I placed my kids’ favorite little toys, The Littlest Pet Shop animals. Whatever fits, and it depends on what plastic egg you get. Back in the freezer for seal to harden. After that I wrapped them with foil, and decorated with stickers. That is the beauty of making these, you get to use whatever chocolate you, or shall I say, your kids like, and you and them can decorate together, personalize with their names, or names of their friends and family. I think it’s a great idea for Easter. It’s making a treat, and crafts all in one! Possibilities are endless. You can use just one kind of chocolate, and also you can fill it with whatever you want. So, all you need is some plastic eggs, chocolate, and proper tempering, and for tempering the chocolate I have followed these directions. This is my contribution to Sugar High Friday #52, a monthly food blogging event created by Jennifer, The Domestic Goddess, and hosted this month by lovely Marija @ Palachinka blog. She chose a theme copycat, and what a great idea that is! How wonderfully creative! I love this idea. Love this post!! 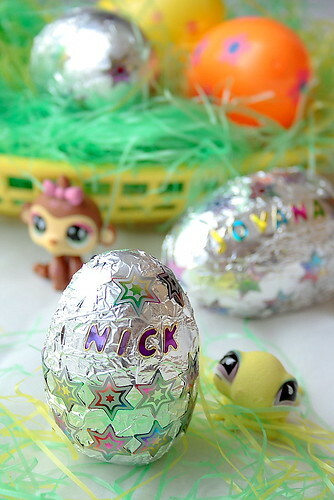 I am so making these for my husband at Easter. He is Canadian and likes them too. Thanks for sharing your technique. Wonderful! These are beautiful and they seem so easy to make. And I LOVE the photo. Thanks for sharing. Fantasticna ideja, a napravila si ih kao profesionalac! Prelepo! molto bello il tuo blog!!!! These are fantastic!! I love the Kinder white and milk chocolate mix and the Kinder Surprise toys are so cute. My son can't have either due to the dairy. Even though tempering chocolate terrifies me, I have to try making at least 2 or 3 for Easter. Were they hard to get out of the plastic eggs? that's such a cute idea!!! :) I love surprise eggs too :)! yours look supernice!! A very talented contribution. We do not have these here in the States. Whenever I went up to Canada I would always buy them. Once I bought a ton of them on my way to Alaska via Toronto airport. I shared them with my fellow travelers. We all loved them. How fun! Maggie clued me into your chocolate eggs, I already have some homemade Cadbury Eggs in the fridge, but this would be this would be such a hit!